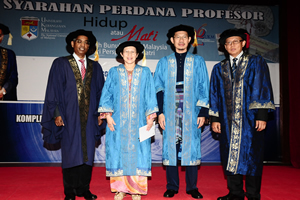 BANGI, 3 Dec. 2010 – Globalisation, urbanisation and ‘life on the go’ in cities have weakened the social support system resulting in increasing incidents of suicide cases in Malaysia, said a UKM Psychiatrist today. Prof. Dr Maniam Thambu from the Medical Faculty said that normally religious beliefs, social support and consideration of the feelings of loved ones like family and children would act as a deterant to the taking of one’s life. 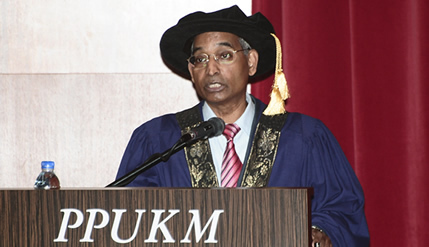 Unfortunately, the influence of globalisation and urbanisation had threatened the socio-cultural aspects of society thereby weakening those safeguards against suicide, he said in his inaugural lecture at the UKM Medical Centre today. He said children had been one of the neutraliser of an intention to commit suicide, but now instead of being a deterrent some innocent children had become the victims when their parents decided to commit suicide. There is an increasing number of parents who suffer from depressions killing their children before taking their own lives. In 2005 eight children were killed in that manner in Malaysia, he said. Because of urbanisation and life constantly ‘on the go’ the social support system has been weakened. Relationships between individuals which used to be close has changed with some having the ‘couldn’t care less’ attitude. Social gaps between cultures was also widening where social behavior once considered unacceptable has become the norm, he said. Religion is also losing its preventive grip in stopping people from committing suicide because the multicultural nature of today’s society have actually effected one’s faith in religion. “Faith in religious values and practicing a religious life has become unimportant. The main function of religion is thus threatened by multiculturalism. Basic religious functions which is to integrate individuals into their society has also weakened,” said Dr Thambu. He also said that the media had also unintentionally promoted suicide when they highlighted such cases with the hope of preventing such incidents. But that had backfired when some researches had shown that such exposure had inadvertantly encouraged certain individuals to emulate the behavior. Dr Thambu mentioned the case of a 50 year old man who had attempted suicide with fumes from his car exhaust pipe. “The man was asked why he chose such a method to take his life. He then showed a news clipping giving detailed description of how a person had committed suicide by inhaling fumes from his car’s ehxaust pipe” he said. Dr Thambu also said that the internet has also become a double edged sword where over 100, 000 websites about suicides are now in operation since the end of 1990s. Dr Thambu proposed some control over websites that promote suicides and that the media should also be given some guidelines on suicide reporting, to discourage depressed people from thinking that suicide is a solution to end their problems. 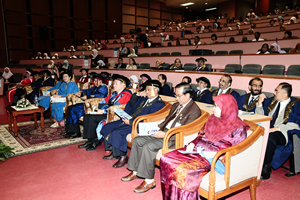 Vice Chancellor, Prof Tan Sri Dato Sharifah Hapsah Shahabudin and deputy VC, Dato’ Hassan Basri attended the talk.